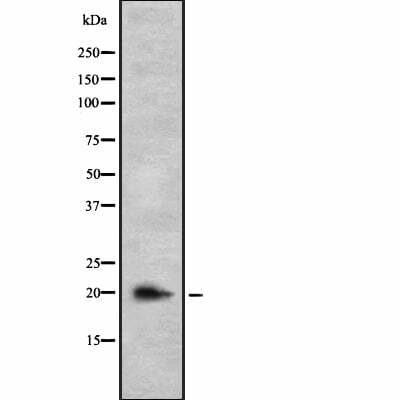 Small volumes of anti-IL26 antibody vial(s) may occasionally become entrapped in the seal of the product vial during shipment and storage. If necessary, briefly centrifuge the vial on a tabletop centrifuge to dislodge any liquid in the container`s cap. Certain products may require to ship with dry ice and additional dry ice fee may apply. Function: May play a role in local mechanisms of mucosal immunity and seems to have a proinflammatory function. May play a role in inflammatory bowel disease. Activates STAT1 and STAT3, MAPK1/3 (ERK1/2), JUN and AKT. Induces expression of SOCS3, TNF-alpha and IL-8, secretion of IL-8 and IL-10 and surface expression of ICAM1. Decreases proliferation of intestinal epithelial cells. Is inhibited by heparin. Similarity: Belongs to the IL-10 family. NCBI/Uniprot data below describe general gene information for IL26. It may not necessarily be applicable to this product.